This post contains spoilers for Jurassic World: Fallen Kingdom. You know the Jurassic Park origin story, right? It was all the idea of Richard Attenborough's quixotic John Hammond, who is jolly and totally out of his depth. Well, Jurassic World: Fallen Kingdom begs to differ. Excuse me, what? Yes, the new sequel from director J.A. 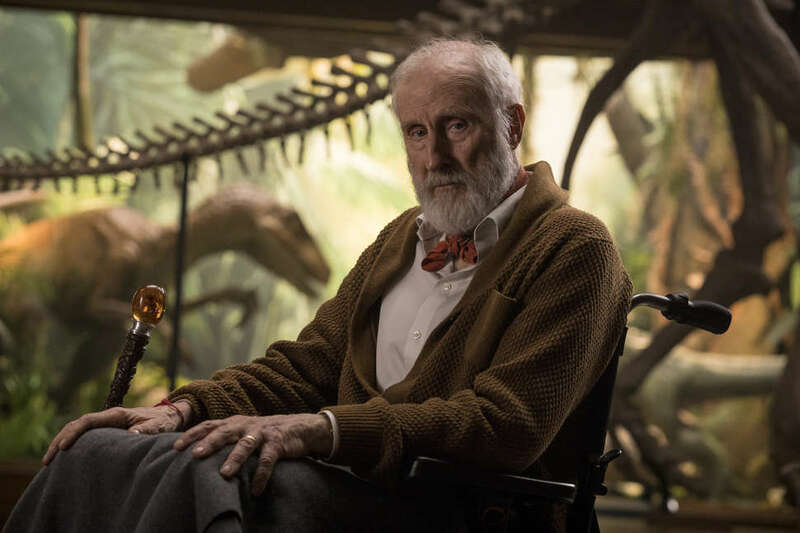 Bayona retcons the means in which dinos were brought back to life in the form of a new character, Benjamin Lockwood, played by James "that'll do pig" Cromwell. This is presumably a way to deal with the fact that Attenborough, sadly, died back in 2014, and the narrative needed an elder statesman type with some connection to the park's history for their narrative. However, Lockwood is introduced in such a way that presumes the audience knows who the hell he is. And yet, his name has never appeared before in the Jurassic Park lore. So let's dig into it. If you didn't happen to catch Cromwell's appearance on Larry King Now last year, you will first hear the name Lockwood when Bryce Dallas Howard's Claire gets a call from his estate. Claire -- formerly a sexist stereotype of a hard-nosed businesswoman -- now runs the Dinosaur Protection Group, an organization that aims to preserve the prehistoric pals now that Isla Nublar is now under threat of destruction by an active volcano. Upon getting the ominous message, she drives up to a stately mansion where she's greeted by the suspiciously genial Eli Mills, who is in charge of Lockwood's affairs. Through the exposition, we learn that Lockwood was Hammond's partner way back when, but had a rift, and thus, that's why you've never heard of him, and not just because he never existed prior to this movie. Lockwood wants to save the dinosaurs before he dies, that's what! He's not doing great these days. He's wheelchair-bound and is mostly confined to his bed. However, he's trying to engineer a way to get some of the dino friends into a sanctuary setting, so they can live out the rest of their lives in peace. That's where Claire comes in: They need to save Blue, that human-friendly raptor that her old pal Owen (Chris Pratt) trained. That means they want her access to the abandoned Jurassic World park and Owen's raptor wrangling abilities. As you might expect, there is something fishy going on: Eli has duped his weakened boss and has plans to turn a profit from all of these creatures, selling them off to unsavory rich people who want to use them as pets, weapons, or targets. So are Lockwood's intentions pure? One of the people running around the makeshift museum on his compound is his granddaughter, a curious girl named Maisie (Isabella Sermon). From the beginning it's obvious there's something a little uncanny about her. She speaks in a British accent most of the time, but when she slips into an American one, she's chastised. So, like, where is she from? And who, exactly, is her mother, who Lockwood mourns? All the while, you're waiting for a reveal that the elder Lockwood woman is maybe someone we have met before. (Whither Laura Dern? Julianne Moore?) And then -- here's where the big, T. rex-sized spoilers come into play -- we learn that her mom isn't technically her mom because Maisie is actually a clone. Seems that Lockwood got a little ambitious with his ability to replicate DNA and didn't limit his experiments to ancient animals. Maisie, of course, is an innocent in all of this, but considering that humans in these films keep acting on their incredibly bad ideas when it comes to genetics, Lockwood's decision could portend more horrors when the next installment comes along.